If you hurry, you can get tickets for the special wine pairing dinner November 18 at Roxy, the fine dining restaurant at the Eldorado Resort Casino in Reno. There are two seatings for this dinner presented by Gregg Carano, and based on my wine review a few weeks ago, I suggest this event. 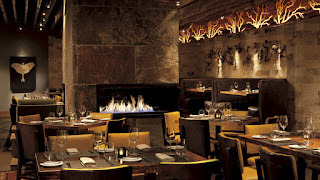 Ferrari-Carano wines were the majority of the wonderful selections that Jeff Vachon, wine director, chose for us, but Roxy’s extensive wine list has been repeatedly lauded by Wine Spectator Magazine. On November 18, you taste many of the same wines that we tasted. I wish my waistline would allow me to partake a second time, although I did work off some calories after dinner by dancing in front of my Showroom seat at the terrific Jersey Nights tribute to Frankie Valli. The Lazy Creek Vineyard, Anderson Valley Riesling 2010 is a classic Riesling. This Riesling has not too much of that characteristic petrol aroma, and it is a light colored and light-tasting wine. 13.5 per cent alcohol. $6 the glass or $25 the bottle. Roxy’s chef Jakon Tolhurst paired it with Frog Hollow Ranch pear salad. The Ferrari-Carano Tre Terre, Russian River Valley 2010 Reserve Chardonnay has aroma and taste of pear, citrus, buttercream and hazelnut. Yummy! Grapes are sourced from three different vineyards, and this wine is kept in French Oak. It is a Burgundian style of Chardonnay, featuring more minerality than you will find in many California Chardonnays. 14.1 per cent alcohol. $16.50 the glass, $65 the bottle. This wine paired perfectly with the duck confit ravioli. Ferrari-Carano Prevail West Face Cabernet Sauvignon 2007 is a blend of 68 percent Cabernet Sauvignon, 32 percent Syrah. Sourced from the steep slopes of LookOut Mountain which sits at the junction of Alexander Valley, Knights Valley and Chalk Hill appellations, these grapes are not too tannic and produce dark, concentrated aromas in the finished wine. Flavor is of warm berry pie, butterscotch, chocolate, caramel and toast. 14.5 per cent alcohol. $15 the glass, $59 the bottle. The pairing was a seared venison New York style and a Merguez style venison sausage. The perfect end was a not-so-honey dessert wine, Ferrari-Carano’s Eldorado Gold, a blend of Semillon and Sauvignon Blanc grapes from Sonoma County. 13 per cent alcohol. $15 the glass, $60 the bottle. If you go to Roxy on a non-wine-dinner night, I highly recommend enjoying one of their well-priced ($12-14) wine flights that feature 2 ounce servicing. The Italian flight, the Light and Bright, or The Golden Girls would be my choices. Roxy is at 345 North Virginia Street, Reno. Reservations online at www.eldoradoreno.com or 775 786 5700. As you read this, Sierra Foothills vineyards will be almost done with harvest, and winemakers are looking at the sugar content of their juice, deciding whether to add this yeast or that, ferment cold or otherwise, and filter or not. So many decisions go into producing an excellent wine, but if the wines poured at the 3rdannual Sample the Sierra event held in South Lake Tahoe in September are indicative, the wines will continue to be good. Sample the Sierra is a cooperative effort of El Dorado County organizations, growers, producers and businesses to increase awareness of the region’s bounty, heritage, culture and activities. 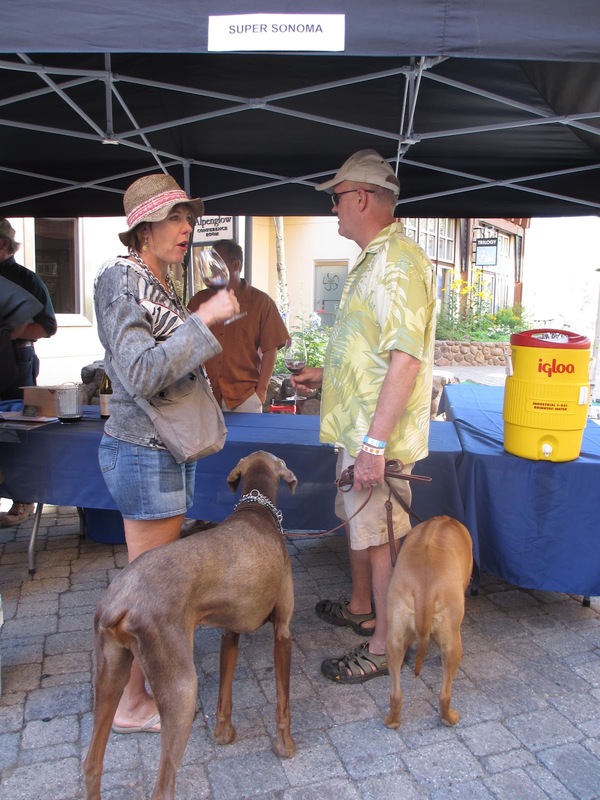 A great addition this year was the Rotary Club of South Lake Tahoe booth that enabled tasters to join the wine clubs of the various wineries. Shadow Ranch Vineyard, located on Fair Play Road in Somerset, El Dorado County, poured its new red blend, Sheriff, which comprises 65 per cent Zinfandel and 35 per cent Syrah. This is a non-vintage blend, and great with the spicy food from Latin Soul restaurant. 14.5 per cent alcohol, $15/bottle. www.shadowranch.com. I like wine, but I really LOVE dogs. 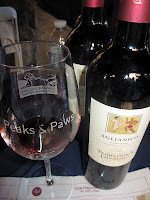 So when the opportunity came to combine the two by attending the great charity event Peaks & Paws at Squaw Valley, I couldn’t resist. Proceeds benefited the Humane Society of Truckee-Tahoe, and I’m pretty sure I saw the soft touch of Kali Kaliope, owner of Uncorked wine shops, in encouraging the wineries that poured for the event. 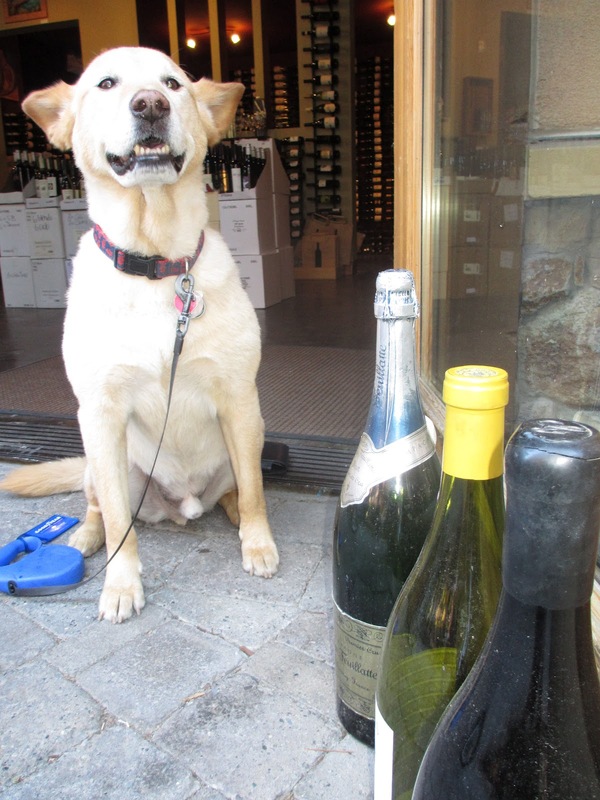 Most of these wines are available at the various Uncorked wine shop locations in the Tahoe area, including Petra in Northstar. Bob the Dog was pretty interested in making friends, so it was difficult to get to all the tasting stations. As befits the occasion, we started at Dogwood Cellars, tasting their 2007 Zinfandel, Mendocino. The grapes for this wine were sourced from BRutacao Vineyards, and 700 cases only were produced. Deep ripe berries rise up to greet the palate, and such exotic spices touch the wine too. Taste of blackberry, boysenberry, dark cherry, sage and brown sugar make this a hearty and delightful wine. 15.4 per cent alcohol, $28/bottle. 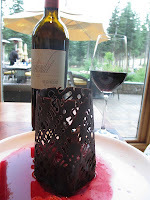 The star of the show, to my mind, was the Aglianico Campagnia 2010 Red Wine Terredora Di Paola. This Italian red is an intense ruby red color, with flavor of black cherry, blackberry and plum, topped off with a nice spicy and toasty tone. It is soft and elegant, with a nice long mouthfeel of red fruit. It has sufficient structure to age well, and is a very versatile food wine. 12.5 per cent alcohol, $19/bottle. Super Sonoman presented its 2007 Meritage red wine from Sonoma County. This is a wine sourced from grapes grown at high altitudes on the west side of the Mayacamas range in Sonoma. Good acidity characterizes this Meritage, which is a combination of Cabernet Sauvignon, Cabernet Franc and Malbec, and it has a lot of structure. It features an aroma of black raspberry, flowers and a hint of coffee or tobacco, with taste of black currant and licorice and a bit of smoke. Sweet tannins and a velvety texture make it drinkable now, or it can age nicely. 14.5 per cent alcohol, $75/bottle. 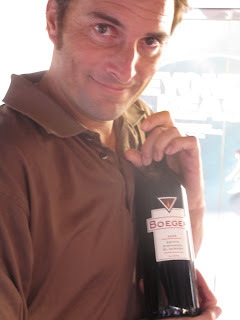 Closer to home, the Boeger 2011 Pinot Gris red wine from their Pinot Grande vineyard in El Dorado County, Sierra Foothills, has aromas of honey, peach and green apple. It is light and delicate on the palate with just a hint of spice. 14.1 per cent alcohol, $15/bottle. The Humane Society of Truckee-Tahoe (www.hstt.org) features adoptions every Saturday from noon to 2 p.m. in Truckee, or call to make an appointment at 530-587-5948. Bob the Dog was a rescue; thank goodness for these organizations! They deserve our support. The Village at Northstar pulls out all the stops (corks?) for its annual Lake Tahoe Autumn Food and Wine Festival. Just when you think you can’t possibly squeeze another wine event into the summer season, this one proves you wrong by featuring the best chefs from the region, and a wonderful group of wineries. 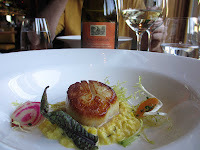 I thought that the best wine-food pairing of the event was the Maldonado 2010 Chardonnay, with West Shore Café’s seared diver scallop and Dungeness crab dish. Constellation Brands is such a huge enterprise that I am sometimes reluctant to beat their drum when there are so many good small wineries around, but this wine is a winner with a seafood dish. Grapes are sourced at their Los Olivos Vineyard, Napa. It is a rich Chardonnay, with refreshing taste of citrus and a light sense of honeysuckle, and nicely lingering flavors. 14.5 per cent alcohol. The 2010 Taltarni Sparkling Brut Tache Rose’ from SouthEastern Australia was delightful. The winemaker notes that “Tache is a French word meaning 'stained', referring to the pale salmon color of this enticing sparkling wine.” This is a classic blend of Chardonnay, Pinot Noir and Pinot Meunier grapes, all of which are estate grown in Tasmania. Aroma of rose petal, peach, and apricot, lead to tastes of red berries and a bit of a nut flavor. The small bubbles are an element in its refreshing character. 12.5 per cent alcohol. The Northstar chefs in charge of their banquet service paired it with a blueberry and chevre wonton. Handley Cellars, located in California’s Anderson Valley of Mendocino County poured a 2011 Gewurtztraminer that was exquisite. This valley is one of the coolest-climate winegrowing regions of the state, and winemaker Milla Handley is known for her well balanced wines. It has aromas of honeysuckle, papaya, and nutmeg and flavors of oranges, honey, and guava. The finish is dry, and this Gewürztraminer will complement many foods. 13.5 per cent alcohol. Stanger Vineyards, located on the west side of the Paso Robles AVA in California, is a true “garagiste” winery producing only 200-300 cases of the delicious Tempranillo that they poured. 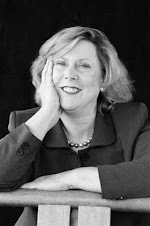 This is a choice of Gail Oversteg, sommelier at Manzanita restaurant, The Ritz-Carlton, Lake Tahoe at Northstar. This estate-grown Tempranillo has a pleasant tannic structure with intense flavors of ripe cherries and a hint of rhubarb, both of which are characteristic of Paso Robles wines. A nice finish of toasty oak, caramel, and toffee. 14.9 per cent alcohol. My one and only trip to Burning Man was in a friend’s RV with refrigerator, shower, and aircon system. But many of my fellow Burners opted for the real deal … tents or canopies with sleeping bags,3rd-wheel trailers, older model cars, station wagons, or just plain thumbing it. We poured wine from real glass bottles: nicely chilled white wines, reds kept at a reasonable indoor temperature. Real-deal Burners opt more eco-friendly packaging, and a price point less than $10 for the bottle equivalent. I visited Ben’s Fine Wine & Spirits’ location on Lakeside Drive in Reno to talk to Drew Craib, the Wine Manager/Buyer. Ben’s has several locations, some of which are closer to the logical driving route. Ben’s is on the prep list for Burning Man. Drew actually tastes all the wine that makes its way onto his shelves. Okay, he does draw the line at known plonk, and some box wines fit that description. Box wines and pouched wines are eco-friendly. They travel well. You can pack a trailer with multitudinous boxes and know they won’t break on the way to the Burn. Some of them are really quite tasty. So if you head to Burning Man in August 2013, keep this list handy. There won’t be that many changes. If you are going camping, this list applies too. I am concentrating on reds since ice costs real money at Burning Man. And it’s hard to find on the camping trail. TOP CHOICE: The Climber, in a pouch of 1.5 liters (2 bottles equivalent). Drew calls it “the all terrain wine transport” system. Made by Clif Family Winery, the same folks that brought you Clif bars, there are several varietals available. $16.99 the pouch. The Cabernet Sauvignon, 14.1 percent alcohol, is tasty. The California Chardonnay, 13.9 percent alcohol, also tasty. SECOND CHOICE: Black Box wines, in a 3 liter box that’s a 4 bottle equivalent. $20.99 for the box. The 2010 Cabernet Sauvignon is 12.5 percent alcohol. THIRD CHOICE: Corbett Canyon’s Pinot Noir, sold in a 3 liter box. This is a mid-grade pinot, with 13 percent alcohol. $10.99 for the box; that works out to GULP $2.25 per bottle. You get what you pay for. A tip of the hat to Fred Franzia, who popularized box wines. “They fly out of here,” said Drew. The Franzia 5 liter box which sells for $15.99 is a 6 2/3 bottle equivalent, or $2.40 a bottle. Best to choose one of their “Home Wine Favorites” choices. I suggest it for dire emergencies only. I’ve had the benefit of the wine selection philosophy of Chef Alan Davis of Sugar Bowl before, and on the patio overlooking Lake Mary, Alan has put his creativity in the kitchen and his philosophy of wine and food to good use again. Alan’s philosophy is simple: he designs food to match the wine. He likes to find complementary wines, and Alan starts every dining year by tasting about 200 wines. 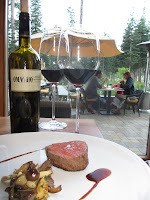 The wines he chose for Lake Mary dinners are both tasty and reasonably priced. The Sartori Villa Pinot Grigio 2011 from Venezia is a dry white wine that is classic for the region. Its white-peach and citrus bouquet prepares your palate for pairing with many dishes, from asparagus tart to goat cheese crostini. It has delicate tropical fruit flavors and a crisp, clean finish. Well-balanced and fresh, the alcohol percent is 12 per cent. It is a great wine with many starter dishes. $8/glass, $30/bottle. Another subtle white on the list is the Veramonte Sauvignon Blanc 2010 from Chile’s Casablanca Valley. This Sauvignon Blanc has juicy lemon and lime fruit aromas with hints of crisp green apple. The wine is medium-bodied with tropical and citrus fruit flavors of white grapefruit and lime with a long crisp finish and some minerality. 13.5 percent alcohol. $8/ glass. $30/bottle. I enjoyed the Hob Nob Pinot Noir, a French red table wine, with the grilled pork tenderloin. This Pinot Noir is slightly sweet but with some tannins too. Taste of black cherries and spice, among other factors, lead me to say this it is less a serious Pinot Noir and more akin to a blend. But it is a fun wine! 13 per cent alcohol. $8/glass, $30/bottle. With pork or the stuffed cabbage dish, my choice would be the Husch Cabernet Sauvignon 2009, from Mendocino County’s Anderson Valley in California. Made from sustainably farmed grapes from the La Ribera Vineyard, it has bold aroma of blackberry, blueberry, allspice, and cola. The very-berry and somewhat spicy taste is augmented by an earthiness that lasts through the long finish. 13.8 per cent alcohol. $9/glass, $34/bottle. A portion of the proceeds from the Lake Mary dinners at Sugar Bowl go to a variety of local charities. To reserve your place at these dinners next season, call (530) 426-9000. The good wine selection and great cooking of Chef Alan will also be a feature of the Dining Room at Sugar Bowl throughout the ski season. The Third annual Wine on the Water charity event at Hyatt Regency Lake Tahoe dedicates all proceeds to the Boys and Girls Club of North Lake Tahoe. Kristi Synder, the exceptional sommelier at the Hyatt’s Lone Eagle Grille, puts her many contacts in the wine world to good use as the 30 wineries pouring at this event are all stellar. Put this event on your “must do” list for 2013. An interesting aspect of attending a multi-winery event in the Sierra Foothills nearby is that you get a sense of not only the currently-poured vintages, but also what the future is likely to present. 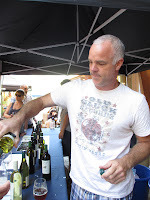 Talking to the wineries at the Nevada City Uncorked event recently, it looks like 2012 will be a good vintage. Grapes are now well past veraison (when grapes turn from green to red) and the heat days are good. Frost was not a problem this year, although water is. Water is a problem in all agricultural products this year, but many Nevada and Placer County wineries have access to irrigation water. It’s not cheap, but it’s available. Cost of wines may be rising, but they should be good. Attention to detail is one of the hallmarks of a good winery, and Seghesio Family Vineyards proves the point. That is a compelling reason that Manzanita, the fine dining restaurant at The Ritz-Carlton, Lake Tahoe at Northstar, chose to host a winemaker dinner featuring Seghesio’s fine wines. Don’t despair if you did not attend this particular event, because Manzanita will be offering these wines on an ongoing basis. The Seghesio Family Vineyards in Sonoma County’s northern Alexander Valley grow fine Italian varietals like Sangiovese, Barbera and Aglianico at their Home Ranch property, and Pinot Grigio, Arneis and Fiano at Keyhole Ranch. 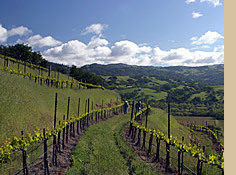 Amazing Zinfandels come from 300 acres assembled in preeminent growing regions in Sonoma County. You simply cannot go wrong with these wines! It is so sad that you can’t buy the 2011 Arneis, Russian River, in stores. You must go to a fine dining restaurant like Manzanita to experience it. This white grape hails from Piedmont, Edoardo Seghesio’s home region. A difficult grape to cultivate, it has flavor of pear, stone fruit, mineral and nice citrus notes. Aroma of apricot and white flowers leads to a crisp and smooth mouthfeel. Although paired with a California peach salad for the special dinner, it would go well with so many dishes. 13.3 percent alcohol. $13/glass, $50/bottle at Manzanita. The 2011 Pinot Grigio, Russian River, is an old vine wine that’s very tasty and not too sweet. Grapes are handpicked in early morning and pressed immediately. 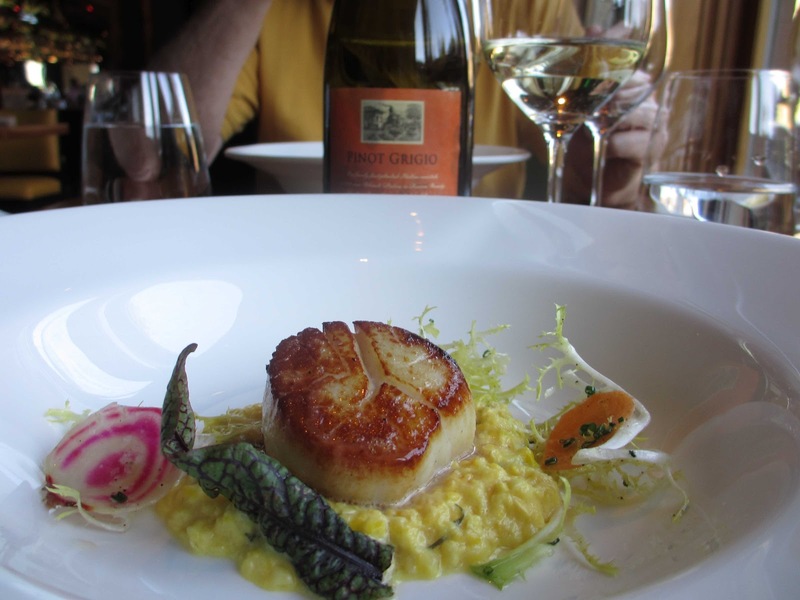 With flavor of honeydew melon and spiced apples with some floral notes, it paired well with the diver scallop dish. 12.7 percent alcohol. When you find this wine at retail, you’ll pay about $22/bottle. 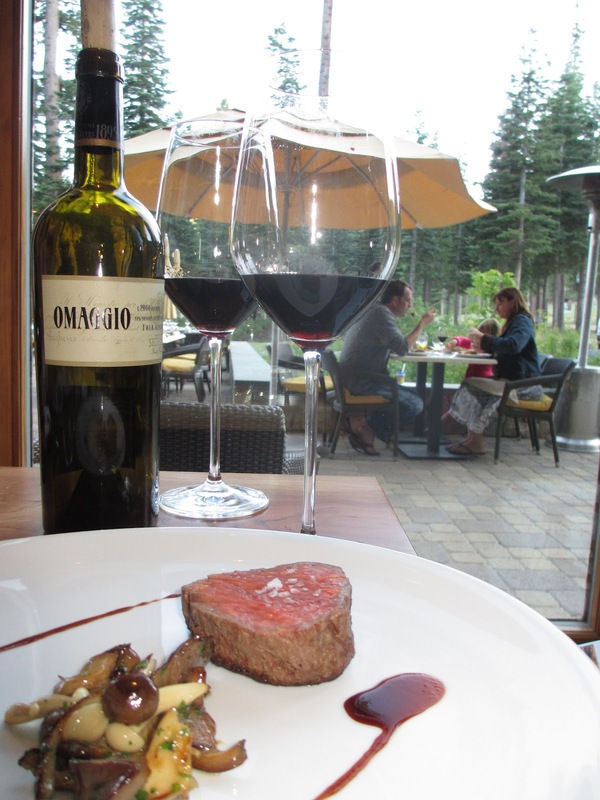 An absolutely perfect food-wine pairing was Manzanita’s prime filet with Seghesio’s Cabernet/Sangiovese blend, the 2008 “Ommagio”, Sonoma County. In 1920, Eduardo planted what is now America’s oldest and most acclaimed Sangiovese vineyard using a proprietary clone. It is too easy to call this wine a Super Tuscan, because it has refinement and elegance. Black currant and cassis flavors from the Cabernet Sauvignon combine with the ripe blackberry and acidity of the Sangiovese. 15.2 percent alcohol. $20/glass, $76/bottle at Manzanita. A beautiful and exquisite triple chocolate gateau dessert was magnificent with the 2010 Zinfandel “Rockpile”, Sonoma County. Bramble is the taste sensation that comes to mind, with intense fruit flavor. 15 percent alcohol. $38/bottle at retail. What did Shakespeare drink? Sadly, it probably wasn’t wine, although he pined for it enough to write about it a lot. 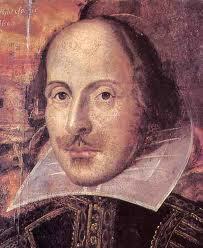 “Come, come, good wine is a good familiar creature if it be well used,” the bard wrote. So if you went to this year’s Shakespeare offering at Sand Harbor (Two Gentlemen of Verona), here is what you could choose to drink. 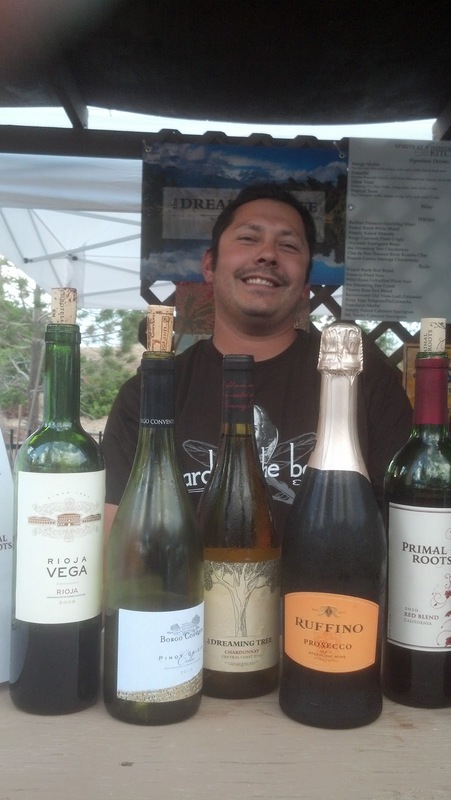 Actually, there were many good wine selections in the vendor area at Sand Harbor’s Shakespeare Festival where you pay a very reasonable $7 per glass for the interesting offerings on their tasting list. Or, for $20, you can have three pours from the following choices. Ruffino Prosecco DOC. There are lovely fine bubbles in this sparkling wine that is extra dry. Aroma that is intensely fruity leads to a taste of apples, pears and citrus. It is crisp and clean, and lovely as an aperitif or as a versatile companion to many foods. 11 per cent alcohol. The Borgo Conventi Pino Grigio 2012 originates from Collio in Friuli, Italy. It has an aroma that is quite fruity, and a predominate taste of ripe pear. It is well structured and with a harmonious yet delicate body and a long finish. 13.per cent per cent alcohol. 2012 Dreaming Tree Chardonnay from California’s Central Coast is a collaboration between Dave Matthews and winemaker Steve Reeder. Wonderfully fruity, with a taste of roasted pear or baked apple, brown spices and a citrus note. This wine is very easy to enjoy and absolutely delicious on a warm summer night. 13.5 per cent alcohol. 2010 Primal Roots Red Blend brings together Merlot, Syrah and Zinfandel in this wine that hails mostly from California’s North Valley, a combination of several AVA’s from Lodi and northward. Aroma of black cherry, vanilla and spice leads to a medium body and smooth taste of raspberry, tea, chocolate and orange zest. Nice soft tannins and gentle acidity result in a finish that’s not too strong, given all the fruit. 13.4 per cent alcohol. 2009 Rioja Vega is a blend of 75% Tempranillo, 15% Graciano and 10% Mazuelo that results in afragrant and well structured wine. Aroma of balsams and spices too are found in this typical offering from Spain’s Rioja region. Yummy. 13.3 per cent alcohol. I’d heard in the past about the wonderful Gourmet Food and Wine Tasting fundraiser for Lake Tahoe Community College, but I can now say with assurance: put the Taste of Gold event on your calendar for next year. Held on campus in South Lake Tahoe, this event featured 10 El Dorado/Sierra Foothill wineries and 8 wonderful restaurants who prepared tastes that paired well with the wines. Other El Dorado wineries pouring were Colibri Ridge Winery, Crystal Basin Cellars, Grace Patriot Wines, Lava Cap, Madroña Vineyards, and Perry Creek Winery. It’s a great and easy day trip from Tahoe to taste the wonderful wines of El Dorado county. All proceeds from this event benefit Lake Tahoe Community College Foundation, which supports scholarships and College programs. Find out more at www.ltcc-edu/foundation and get on the notification list for next year’s event! Italian food, one of the world’s great cuisines, is well matched with many wines. 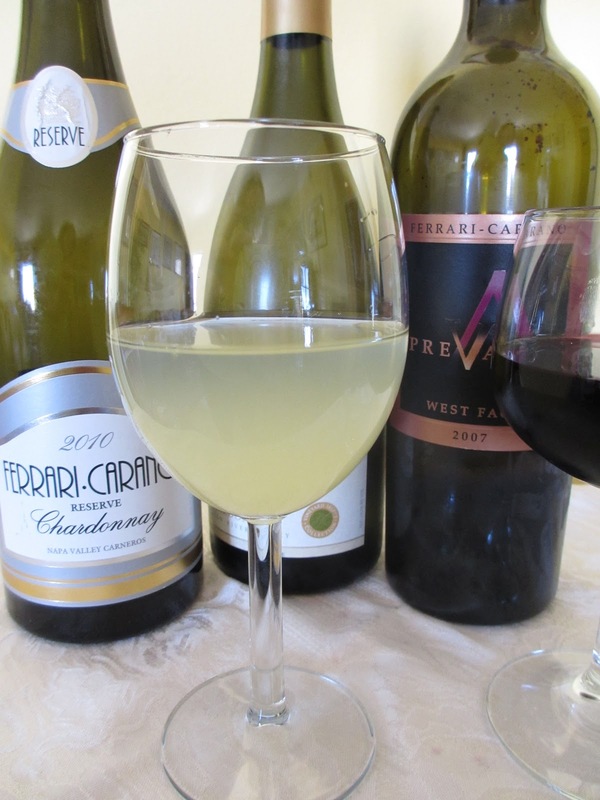 Not all of those wines need be Italian; there are many great choices. All it takes is a talented wine lover to develop a good list, and that’s what you’ll find when you go to Zia Lina Ristorante in downtown Tahoe City. Working through the wine list, there were many wines that paired well with their dishes. Here are some of my favorites… go and try them yourself! To begin, a Villa Sandi Prosecco Brut, DOC Treviso, Italy. The light bubbly was fresh tasting, with citrus tones, a touch of herbs, nice minerality and a pleasant acidity. 11 per cent alcohol, $8/glass, $28/bottle. With the Caprese salad, we paired the 2011 Truckee River Winery’s White Barn Pinot Gris. Grapes are from the Apple Hill region near Placerville in El Dorado county, California. Winemaker Russ Jones has produced a wine that is crisp and clean with hints of pears and apples, and a touch of nut. 12.8 per cent alcohol, $9/glass, $28/bottle. The 2010 Ceretto Blange Arneis from Italy’s Piedmonte region was served with the artisanal cheese plate. Arneis is a winegrape that is native to Italy. This is a fruit-forward white wine, with hints of apple and pear, honey and almond, a bit frizzante with a nice acidity, and characteristically earthy like many wines from Piedmonte. 13 per cent alcohol. $10/glass, $34/bottle. Also a nice match with cheeses is the 2010 Keenan Chardonnay, Spring Mountain, Napa. This small family-owned winery that produces a very classic California Chardonnay. Buttery, oaky, taste of pear and citrus…vinified by Nils Venge, a legendary Napa winemaker. 13.9 per cent alcohol. $38/bottle. With the arrival of the crispy risotto, we moved to red wines. The 2009 Lincourt “Lindsay’s” Pinot Noir from Santa Rita Hills in the Central Coast region of California, has good red fruit flavor with layers of black cherry and leather, and lots of spice. 14.5% alcohol. $11/glass, $36/bottle. The 2010 Peccinino Dolcetto di Dogliana, a Chianti from San Luigi in the Piedmonte region of Italy is a wine that, in my opinion, is very meat friendly although we paired it with one of Zia Lina’s create-your-own pizzas. It’s a nice earthy wine with dark fruit aroma and flavor, strawberry and black pepper, and that trademark Dolcetto nose of violets. Yum. 13 per cent alcohol. $28/bottle.